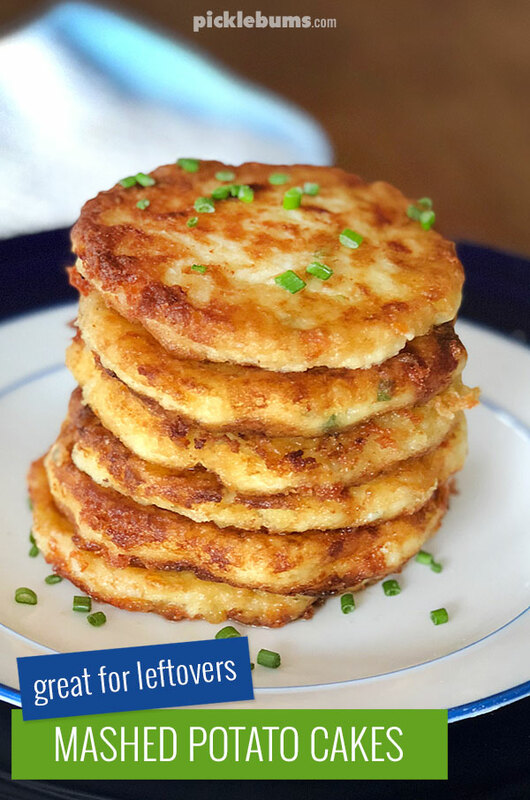 Mashed Potato Cakes – perfect for leftovers! 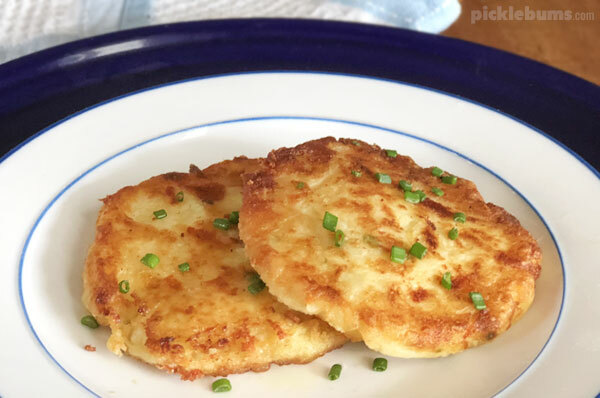 These mashed potato cakes are soft on the inside, crispy on the outside. With a little bit of cheese and a handful of spring onions, they are delicious way to use up leftovers! I love mashed potatoes, and so does my middle child. The rest of my family can take it or leave it, except for my youngest, he hates it! And while I’m usually one to encourage my youngest kiddo to try foods he is not fond of, in this case I more than happy for him to hate mashed potatoes. Because if Noah doesn’t eat any mash, and the rest of them just have a small serve, it means there is lots leftovers so I can make amazingly delicious mashed potato cakes. I can not begin to tell you how good these mashed potato cakes are. They are everything that is already awesome about mashed potato, combined with a bit of cheese and onion, with added outside crispy-ness. So good! Making these mashed potato cakes is not an exact science. How much flour you add to the mixture depends on how chunky or smooth your mash is to begin with. If you like making your mashed potato with lots of butter, cream, or milk then you’ll probably need to add more flour to get the cakes to stick together. If, like me, you make your mashed potatoes with only a little bit of butter and a splash of milk then stick to the 3 tbsp of flour. If your mixture is very thick or not staying together, you might need an extra egg, but our medium sized home laid eggs are enough when I make it. I love onions so I add loads of chopped spring onions (shallots) to the mixture, but you can leave them out if your kids are disgusted by them. You can also add a half cup of cooked chopped/mashed broccoli or cauliflower, just make sure there are not big chunks. One more tip: don’t add too much cheese! I know, I know, there is not such thing as too much delicious cheese, but in this case there is. If you add more cheese the potato cake will stick to the pan and be more prone to falling apart, so don’t be tempted. Combine the mashed potato, beaten egg, flour, cheese and chopped onion in a bowl. If the mixture is too wet, add more flour until it comes together in a thick 'dough'. Add some extra flour onto a plate. 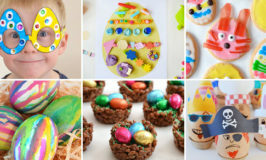 Form large spoonfuls of mixture into balls and coat both side with flour, patting them down to form a thick 'pancake'. Cover the bottom of a fry pan in olive oil and warm over a moderately high heat. Once the oil is hot, fry the potato pancake over a medium heat, for 2-3 minutes each side, or until each side is crispy and golden brown. 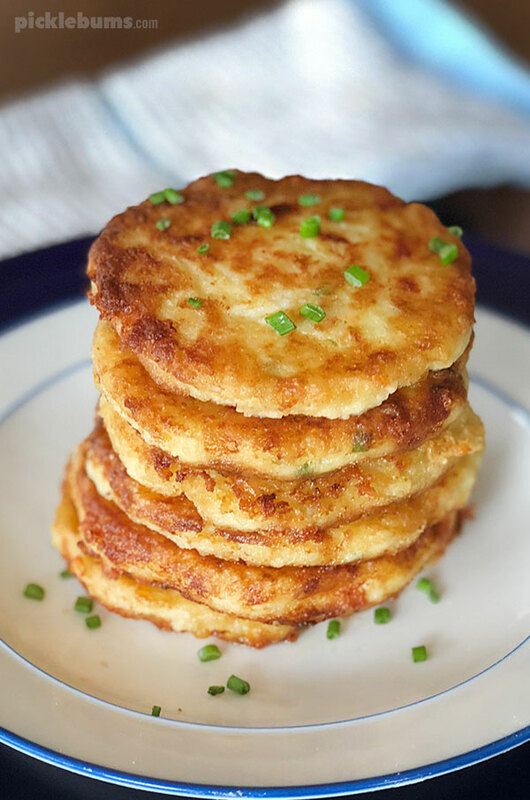 If you are working towards zero waste cooking, mashed potato cakes are the best way to use up leftover mashed potato. They make an awesome lunch, or as a side with dinner. Check out this article for more tips on reducing food waste, and this one for lots of ways to use up leftover roast chicken. These were soooooo good! I make potato pancakes a lot and this was a great deviation from that. My youngest hates mashed potatoes too (how? child, how? 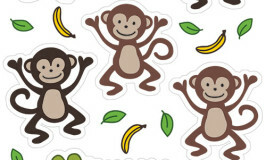 )- but loved these! 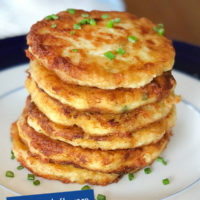 Home » Mashed Potato Cakes – perfect for leftovers!